This album from Philly-based Berry Jones is an extremely refreshing release from some young new talent. Tonight is a collection of works that honors two musical legends who spent their careers perfecting the art of the dance song: Quincy Jones and Berry Gordy. Released on a format I happen to think is ideal for today’s consumers (LP w/ free MP3 download), it’s one of my top Summer picks that will surely be great for late night parties and lazy beach days alike. As I said, all of the music was conceived as an homage to two of leader Jim Thomas’ musical heroes. Creating something that stands up to such visionaries is quite a tall task but Thomas does it with great reverence while being sure to inject his own youthful sensibilities into the mix. The album is separated (rightfully so) into an A Side & B Side, true to vinyl form. 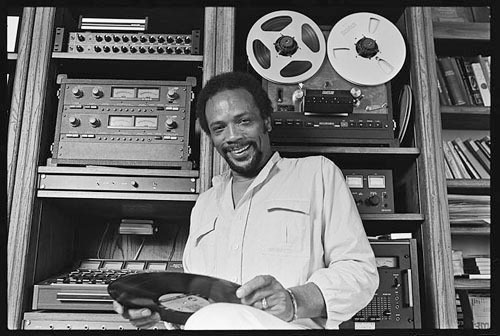 The A side tends to showcase the aesthetic and appeal of mid-80’s Quincy Jones. Throughout you’ll hear all the electronic synthesized tendencies that ooze so tastefully from those great Michael Jackson albums of the era, along with a pulse that undeniably makes you want to move. The opening track “Bouffant Bangout” is, perhaps, the best tune on this side as it’s inclusive of all the elements that made Quincy an icon. “Philly Night” is also a standout but it’s difficult to narrow them down as each song has it’s own unique thing happening and all are equally enjoyable. The B Side is full of tunes that bring back that propulsive Motown sound. Wisely, Thomas doesn’t try to recreate the sound of Gordy’s famous Studio A. Instead, he focuses on the power of those old R&B arrangements from yesteryear. It’s a style that has nearly been forgotten by young musicians but Thomas seems to be a long time fan who grew up listening to old Detroit soul music. Fittingly, there is a little inspiration from the Sweet Philly Soul days as well. As a native to the Philly area, it would be hard to ignore such influences like Jackie Wilson, Harold Melvin & The Blue Notes and even The O’Jays. As evidenced by songs like “Baby, Baby” and “Work It Out”, he definitely has a firm grasp on this 60’s soul thing. But, what is most interesting to me is how the sound and style of the contemporary singer/songwriter at the heart of Thomas’ solo work blends so smoothly with the material on this entire album. By design, it’s a concept album but in execution it’s much more. Each song is a testament to something old but they all seem so relevant and relatable for young audiences. As an album, it proves to be very accessible and may be just what the doctor ordered for the tail end of this long, hot Summer. Below are some links to learn more about the album, artist and this interesting side project. Of course, you will also find a link to sample the album and purchase it in either vinyl or digital format.